On Monday afternoon, exceptional interest was evoked in the little village of Escomb, on the occasion of the re-opening of the ancient parish church, the only perfect example remaining of Saxon architecture, so far as is at present known, in the North of England. 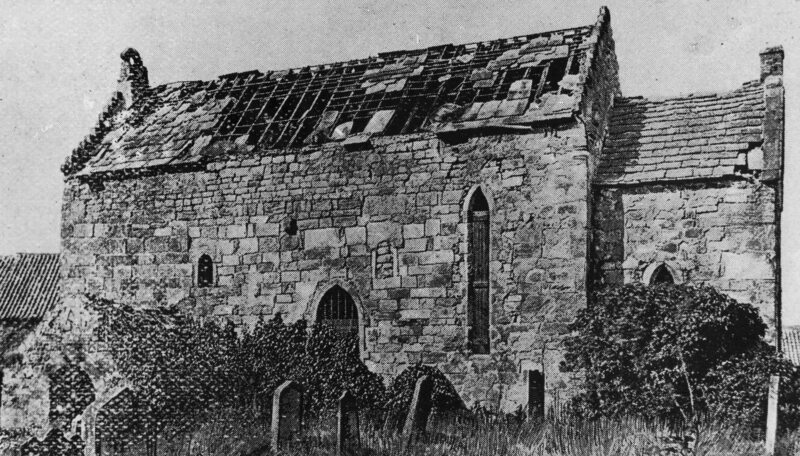 At Jarrow there is a very interesting chancel, and at Monkwearmouth a tower and west front, but the edifice at Escomb is complete from end to end, almost without flaw, and stands as a monument of the work and of the religious feeling of our Saxon forefathers. The edifice has been so frequently described by archaeologists and antiquarians, since its true character became known, that it would be a work of supererogation to attempt anything like a description of it here. All that need now be said of it is that the repairs have been carried out under the personal superintendence of the Rev. T.E. Lord, the vicar, whose efforts are generally acknowledged to have been wisely directed, and the work itself satisfactorily performed. 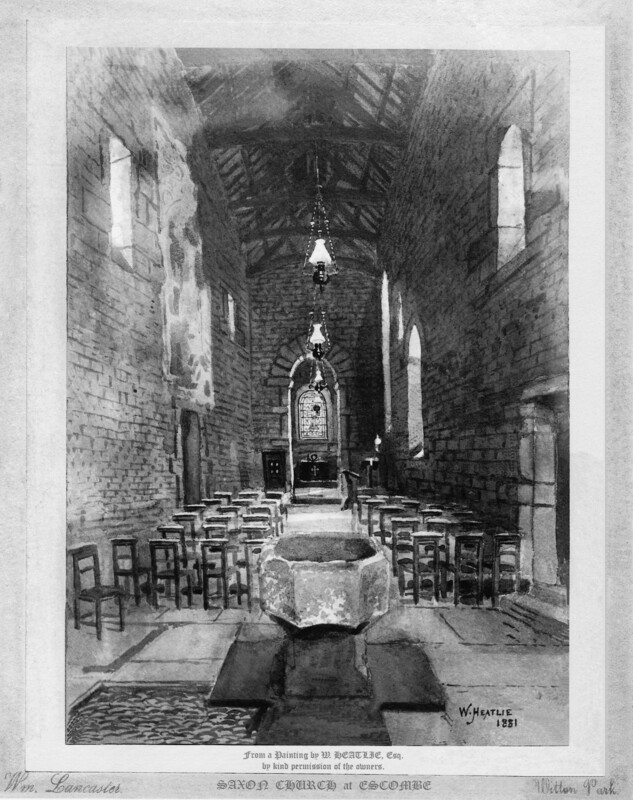 Although no formal announcement had been made of the re-opening of the building, a large number of the inhabitants of Bishop Auckland and the surrounding district, together with not a few of the clergy, assembled in the churchyard long before the commencement of the service at 3 p.m; and on the arrival of the Bishop, who was accompanied by the Rev. H.E. 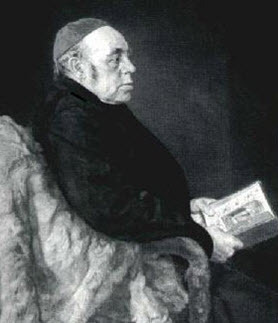 Savage, one of his lordship’s chaplains, all available space in the interior of the church and porch was occupied, and a considerable crowd had to remain outside. Seldom, indeed, have we observed so much interest – mingled with not a little curiosity – manifested in any event of the kind, owing, probably, to the exceptional circumstances under which the ceremony was performed, and to the presence of unusual historical associations and attractions. There was a goodly representation of the principal inhabitants of Bishop Auckland, and a large number of ladies. The Bishop was met at the church gate by the vicar of the parish, who preceded his lordship to his seat in the chancel. There was full evening service, the prayers being read by the Rev. T.E. Lord and the lessons by the Rev. H.E. Savage. The choir of the new church rendered efficient service, accompanied by the harmonium, at which Miss Taplin presided. The church itself – the interior – presented an attractive aspect, some little effort having been made to render it cheerful by the presence of a few flowers judiciously bestowed in various parts of the edifice. The Bishop preached the sermon, founding his address upon Ezra v 2. The collection amounted to £10, which leaves £80 required to clear off the remaining debt on the church. Ezra, “We are the servants of the God of heaven and earth, and build the house that was builded these many years ago.” The words which I have just read described a signal crisis in the career of the most remarkable nation that has ever trodden this earth. They have been carried into exile, and yet they are at home; they have been trampled underfoot and crushed, and yet they lift up their head; they are dying, nay are dead, and behold they live. They have returned to the land of their fathers after seventy years of slavery and humiliation. The first care of their leaders is to rebuild the temple of the living God, the sanctuary of the race. The two great chiefs of the people – the civil governor Zerubbabel, the son of Shealtiel, and the high priest Joshua, the son of Jozadak – apply themselves to the task. The two great prophets of the age, Haggai and Zecharia, stimulate leaders and people in their work. But great difficulties lay across the path. There was opposition and hostility without; there was lukewarmness and apathy within. Above all there was despondency and depression of spirits. They saw everywhere about them wasted lands and ruined homesteads. It is this fact which gives its unique character to our inauguration today. This building may be modest in dimensions, may be rude in structure, may be poor in all its surroundings. Other more magnificent, more spacious, more convenient churches are built and consecrated almost daily throughout the dioceses of this land. But to him who has eyes to see and ears to hear the rededication of this simple house of prayer speaks with an eloquence and a force which is lacking to them all. “These many years ago.” For this building tells of a time when England was not yet England; when Saxons had recently settled in the island and Danes were beginning to harry the coasts, and Normans ere still undreaded, because unknown. It recalls the first beginnings of the church in these northern parts; when Aidan came from the far-off island of the Western shore, the holy Iona, with the earliest message of the gospel of peace; when Finian built his first church on lonely Lindisfarne, with its wooden walls and thatched roof, destined nevertheless to be the precursor of stately, imperial Durham; when Oswald the king planted the cross with his own hands in the ground and knelt before it, he and his whole army, praying, and praying not in vain, for victory over the heathen; when the saintly princess Hilda ruled a religious house and gathered her daughters about her in the Island of the Stag – the Hartlepool of modern days; when Benedict Biscop built his monasteries of Monkwearmouth and Jarrow, twin seats of learning and piety, summoning artificers from far and wide across the seas to complete and adorn his work; when learned Bede rendered up his innocent soul to God who gave it, dictating with his last breath the last verse of the gospel which he was translating; when Cuthbert prayed and fasted in his solitary cell at Farne, with the sea birds for his companions; when the Danish hordes drove the monks from their abode, and they wandered from place to place, carrying with them the precious relics of the saint, till at length he found his resting place at Durham.It is strange to reflect that we are met together today in a building which stood very much as it stands now when the names of Plantagenet and Tudor and Stuart were unknown, and many generations had still to run their course before the ancient cathedrals of Durham and Lincoln should rise from their foundations. When we speak of the Church, we mean sometimes the fabric, the material building; sometimes the community, the body of believers. They are fitly called by the same name, for there is a close analogy between the one and the other. The material fabric is a type, a parable, of the spiritual fabric, for both are houses of God. So, then, let us ask ourselves what lessons on the history and the life of the church may be learned from the building in which we are met this afternoon. (1) First of all there is God’s providential preparation for the Church of Christ. St. Paul says that our Lord appeared in the fullness of time. All things were ripe for His coming at the moment when He came. The world had been prepared and trained in many ways for receiving Him. One most important element in this training was the establishment and spread of the Roman Empire. The Romans were the great law-makers for mankind; the Romans were the great maintainers of order in the world. Again they were the great constructors of roads. Throughout this vast empire, to the remotest provinces, they spread a network of public ways, thus facilitating communication between the most distant regions. This settled order throughout the world was necessary for the peaceful spread of the gospel. These facilities of travel were highly important for the Apostles and early evangelists as they moved to and fro on their missions. In these and many other ways the Roman Empire was only consolidated immediately before Christ came into the world. Thus in this important respect the Incarnation of the Son of God took place in the very fullness of time. Now see how this fact is embodied in the building in which we are met. The very stones cry out from the wall. They are in great part at least, stones hewn by Roman masons, stones built into Roman buildings, brought here from the neighbouring Roman camp of Binchester by our Saxon forefathers. Roman chiselling is on many of them. A Roman inscription is on one at least. The name of the Sixth Legion may still be read, a memorial of Roman power and Roman order stamped upon the fabric of this church. Thus we are reminded by the very stones how the majesty of Rome herself became a handmaid to the Church of Christ, how the precious gifts of all nations were poured into the treasury of our God. (2) And the second lesson which this building typifies is the stability, the permanence, the continuity of the Church. Here is a building which from the solidity of its structure has weathered all the ravages of time. No ill-usage and no neglect has availed to destroy it. Rootless, tenantless, abandoned, it has maintained its ground. Everything around has changed. States have risen and fallen. Nations have appeared and disappeared. The English language, the English constitution, the English empire – what mightly changes have come over these! And yet this little building in this remote district remains substantially the same as when it was reared by the hands of our rude Saxon forefathers, it may be ten centuries ago. Have we not truly here a sermon in stones, a sermon more eloquent and more forcible, as it is certainly more enduring, than all the sermons which lose themselves, week after week, on the air, wafting on the perishing breath of man? Is it not a fit type of that Church of Christ, which, though the rain may descend and the flood may come, though the winds may blow and beat upon it, yet falleth not, for it is founded on a rock. (3)I have spoken of the preparation of the Church of Christ – I have dwelt on the permanence of the Church of Christ as typified in this building. But there is yet a third lesson it may teach us – the resurrection, the revival in the Church of Christ. Is there any page of architectural history more strange than the record of this building? Here it has stood firm, solid, undecayed by time. Worshippers have knelt in it; wayfarers have travelled past it; neighbours have loitered about it. But no-one has cared for it; no-one has given it a second thought. It was a plain, unsightly building, and nothing more. When, 17 years ago, the new church was consecrated, it was suffered to fall gradually into disrepair. The roof decayed; the fouls of the air lodged in its timbers. Not a word was said, and not a finger was raised to save it. So it remained for years. Then suddenly some eyes more keen than others discovered that in this rude, neglected structure we had a priceless relique of antiquity. Now men visit it from far and wide. Every chiselling of its masonry has an interest. The accumulated rubbish is removed, the dilapidations of time and neglect are repaired, and it is once more fit for the service of Almighty God. Is not this again a parable of the history of the Church? Some doctrine of the faith is neglected; some principle of Church order is overlooked; some edifying rite falls into disuse. For generations, perhaps for centuries, it is in abeyance. Then suddenly its utility, its significance, its truth, is discerned; and it takes its place once more in the recognised structure of Christian doctrine, or Christian order, or Christian practice. restoration would be truthful, would be enduring, the same rule must be observed – not to choose a new site, not to erect a new fabric; but to build the house that was builded these many years ago. “Other foundations can no man lay than that is laid, which is Jesus Christ.” “Earnestly contend for the faith which was once delivered unto the saints.” And so the church lives on from age to age, while all around is dying. Encircled with ruins on all sides – fallen dynasties, dying and dead languages, bygone institutions, extinct nations, it survives amid the general wreck. 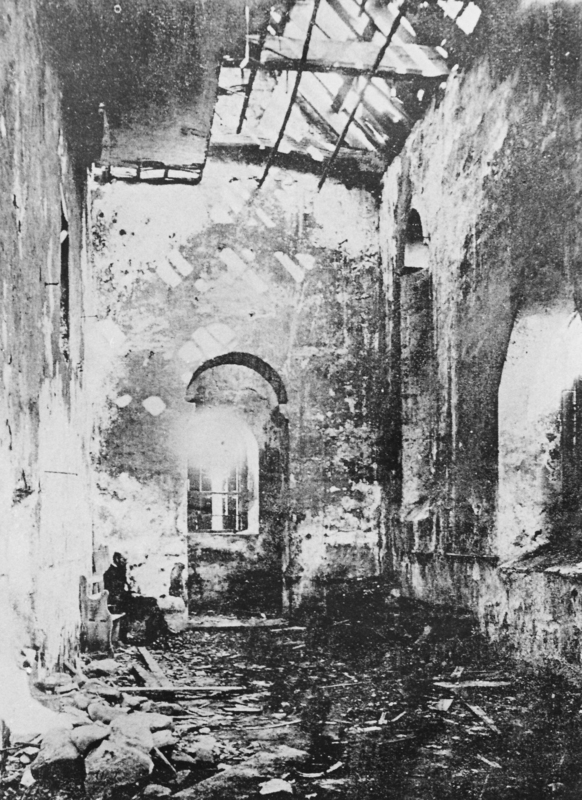 The roof may need replacing; the masonry of the walls may call for repair; the furniture will have to be renewed; the accretions of refuse must be carted away. But the fabric itself stands where it ever stood; the fabric itself defies the heavy hand of time. And has it not a lesson for ourselves also- for you and for me, for each of us individually? “Ye are God’s building; ye are the temples of the Holy Ghost, which is in you;” fabrics reared by His hands, sanctuaries dedicated to His name ; shrines in which He condescends to dwell. Yes, “The Lord is in this place” – this body, this soul, of yours; though perchance you “knew it not. This is none other than the house of God.” And so the building up, the edifying of ourselves – of our heart, of our conscience, of our life – must be our daily task; not for any common or profane use, not for any earthly occupancy , but that, the parts of our nature being duly shaped and compacted, the whole building fitly framed together may grow into an holy temple in the Lord, a habitation of God in the spirit. Only this caution must be observed; we must build not on another site, not with other masonry, not another fabric, “but the house that was builded these many years ago,” builded in our baptism when we were made children of God and members of Christ – builded by our infant prayers repeated at our mother’s knew and our childish lessons learnt from our mother’s lips – builded in our confirmation pledges when our baptismal vows were renewed and our baptismal privileges were reclaimed- builded in those repeated manifestations of Christ’s presence, and those manifold promptings of God’s spirit, which from time to time have been vouchsafed us from above, to guide, to sustain and to inspire us.